Concordat Watch - Czech Republic | Did the Vatican play �good cop, bad cop� to advance Church interests? An archbishop who publicly questioned President Vaclav Klaus’ fitness for office was replaced by one who went with him on pilgrimages and gives him Christmas gifts. Archbishop Dominik Duka, the “smiling diplomat”, had been in office only a few weeks when he managed to remove a roadblock to the concordat that Klaus once claimed he’d never sign. (2012-11-07) It requires patience and ingenuity to get the non-religious Czechs to accept a concordat. On the 2011 census almost half the population left the religious column blank and nearly a further third said they had no religion. The Vatican understands this and appears to be using one of the best-known negotiation tactics: “good cop, bad cop”. First the aggressive “bad cop” increases the stress level of the victim, then the friendly “good cop” makes him feel relieved and grateful — and thereby wins concessions. The Vatican has had three issues on the table with the Czech Government: ownership of St. Vitus cathedral in the centre of the Prague castle, a property settlement and ratification of the concordat. This marks a reversal of the course pursued by Duka’s predecessor, Cardinal Miloslav Vlk, who in May 2009 had lodged a constitutional complaint against the court's verdict, saying the church wanted the Constitutional Court to admit that the Church “rights have been trampled down”. Vlk even said that if the Czech Constitutional Court ruled against him, he’d take the case to the European Court of Human Rights. This heavy-handed approach made it look as if the Vatican were trying to take away a Czech national symbol, for the castle cathedral is where Czech kings were crowned and buried and the crown jewels are held. 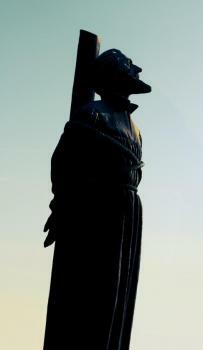 Jan Hus Day on 6 July is a Czech public holiday to mark the date in 1415 when he was burnt to death as a heretic. Jan Hus was a reformer who called for the Church to return to its biblical roots. However, it is for his insistence that the Czech language be used in liturgy and preaching that he is honoured in the country today. Under the new plan the 17 churches which receive state funds, get back 56 percent of their former property — estimated at 75 billion koruna ($3.7 billion). They also receive over 59 billion koruna ($2.9 billion), adjusted to inflation, to be paid over the next 30 years, and the state will gradually stop covering their expenses, including clerical salaries, over the next 17 years. Or at least that's what the churches agreed to in order to get the bill passed. 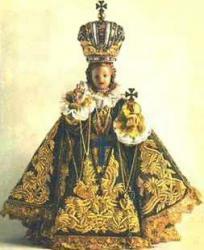 However, it mis worth noting that although the Vatican agreed that the Spanish Church should becomce similarly self-supporting, in that case, within three years, within three years, a quarter of a century after the deadline passed, it was still demanding money every year from the Spanish Government. [x] It can be very difficult to hold the Church to its word, especially when it controls many social services and, pleading poverty, can threaten to withdraw services. The Catholic Church receives four-fifths of the money. It has said that it intends to use this to expand its role in social and health care services. Already the Catholic Church runs about a third of the country's home care and hospices. If the Vatican can finally succeed in getting the rejected draft concordat accepted, article 13.2 will then guarantee full state funding for these services, while articles 5.2 and 10.1 will ensure that these operate in accordance with the Catholic Church’s “own principles” and “in conformity with its own regulations”. For some of the implications of this, see “How faith-based social services do an end-run around human rights”. 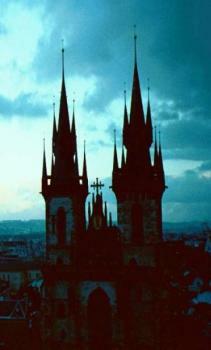 The lovely mediaeval Tyn Church in Prague is where the Hussites worshipped after their leader was martyred. Later it was taken over by the Jesuits. Ratified and promulgated international accords on human rights and fundamental freedoms, to which the Czech Republic has committed itself, are immediately binding and are superior to law. Sometimes, with Vatican help, politicians who favour a concordat try to conceal its content from an electorate that has doubts about it, until it has been signed and revision is impossible. This was done in Poland, Georgia, Brazil and the German states of Brandenburg and Hamburg. The text of the Czech concordat was also kept secret, even though the bilateral commission submitted its first draft in June 2001. It was only revealed on the date of its signing, more than a year later. Its understated title implies that it merely “modifies” relations, as if it were not precedent-setting. An unusual feature is the escape clause in the last article, allowing it to be cancelled unilaterally. This is only used with very reluctant concordat partners: it also appears at the end of the 1989 Brazilian military concordat and the 2008 French higher education concordat. This is a measure of how eager the Vatican is to get a concordat with the wary Czechs. Although President Klaus said he would never sign it in its present form, the Vatican does not intend to change the text of the rejected agreement and still expects the Czechs to ratify it. The efforts of the friendly new Archbishop may yet bring this about. 2. "Ministerial team to work on Czech-Vatican agreement", Czech News Agency (CTK), Prague Daily Monitor, 7 May 2007. On 23 January 2008 the Christian Democrats were still claiming that the timing of this bill right before the presidential election was "a mere coincidence". However, three days later they were asserting that there was a difference between serious political negotiations and horse-trading. 18. 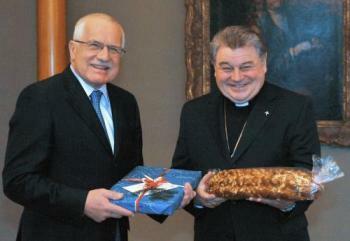 "Vatican wants Czech church more active in health, social areas", ČTK, 2 May 2012.